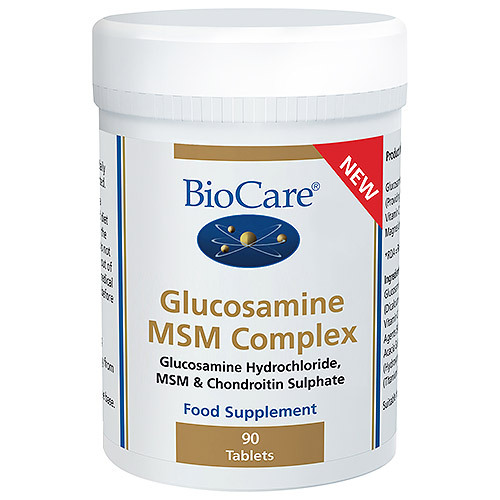 Glucosamine MSM Complex combines glucosamine, MSM and chondroitin in a tablet form. It is a high strength complex to support joint and skeletal health. Methyl Sulphonyl methane (MSM) is a natural substance that is found in sulphur bearing foods and naturally occurs in the human body. MSM helps to support impulses along nerve fibres and maintain muscle reflexes. Sulphur is used as a structural component in connective tissue as well as contributing to production of antioxidant enzymes in tissues and supporting the body’s elimination of unwanted substances. Sulphur aids the formation of methionine and cysteine for collagen synthesis. 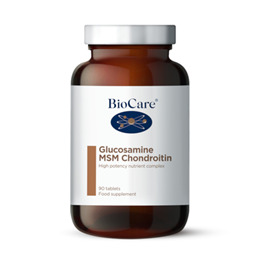 Glucosamine is a vital structural component that imparts strength and flexibility to joint tissue. Glucosamine is a key component of synovial and bursal fluid, connective tissues, mucus membranes, ligaments and tendons. Chondroitin sulphate is a component of the extracellular matrix within the cartilage. Chondroitin may help to prevent cartilage from breaking down and may also stimulate its repair mechanisms. Glucosamine Hydrochloride*, Methyl Sulphony; Methane (MSM), Bulking Agent (Microcrystalline Cellulose), Chondroitin Sulphate (Fish, Molluscs), Anti-Caking Agent (Ascorbyl Palmitate), Silicon Dioxide. One tablet taken three times daily with food, or as professionally directed. Below are reviews of Glucosamine MSM Complex - 90 Tablets by bodykind customers. If you have tried this product we'd love to hear what you think so please leave a review.